It’s been an unacceptably long time since my last post, but hopefully my absence works to your benefit. When I first started this blog, I was happily puttering about the kitchen, content to be an amateur. However, the more thought and effort I put into my hobby, the less satisfied I became with the concept of being an uneducated chef… so much so, in fact, that since January, I’ve been enrolled in culinary school. I am OBSESSED with it: attending is something I’d always wanted to do, but never really considered an option. I’ve been learning a TON and today’s post is dedicated to passing along one of my favorite techniques that I’ve picked up so far. 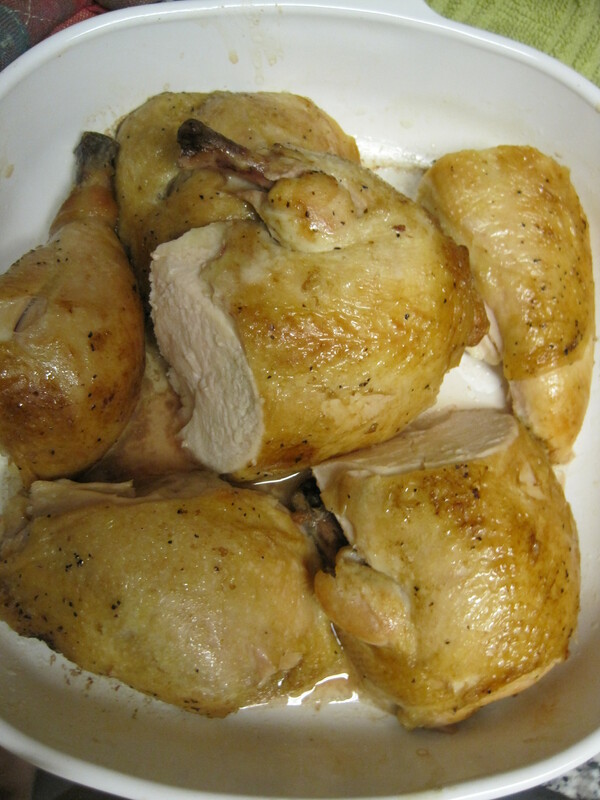 Roasting a chicken was one of the first things I ever learned how to do in my mom’s kitchen. The concept was pretty simple: rub some stuff on the chicken, throw it in the oven for an hour or so, and call it a day. While that can definitely suffice, what I’ve learned in class beats the pants off of that. I used a free-range, organic chicken. It’s a bit smaller than your typical oven stuffer roaster, but I appreciate knowing that my chicken was able to walk around and eat something other than corn. While I never previously paid much attention to the difference between corn fed vs. grass fed chickens, the meat of this organic bird was actually whiter. I started by trimming the chicken wings and cleaning up the drumsticks. I stuffed the cavity with some tarragon and chopped up onions, leeks, carrots, and celery and seasoned the bird (inside and out) with salt and pepper. I trussed the bird to help keep its shape and hold the stuffing inside. I think this next step is the key to the difference between a good chicken and an awesome chicken. 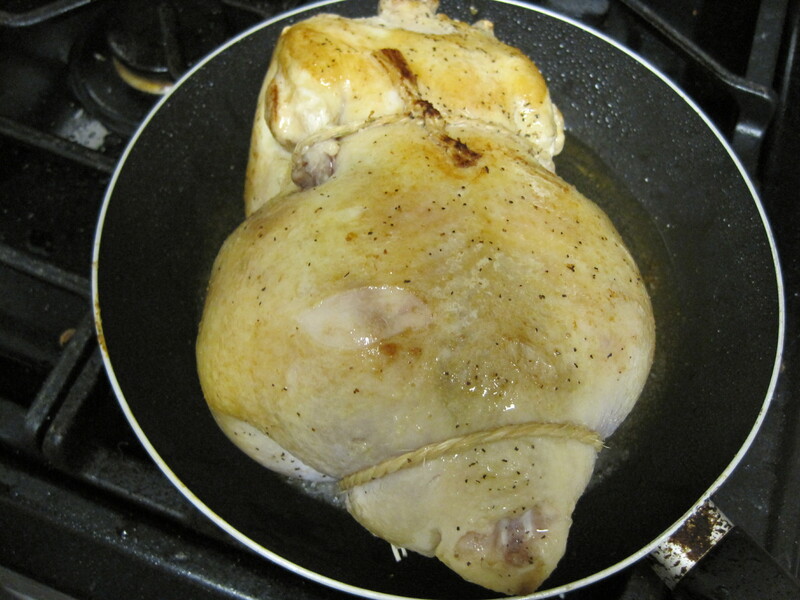 While I’d always previously just thrown the chicken in the oven, browning the skin first makes for a WAY tastier bird. (Not only does your skin get extra crispy and tasty like this, but it also helps make sure all the juices produced during roasting stay inside the meat where you want them.) Heat some canola oil in a medium frying pan. Using a grill fork to turn the bird from the inside, brown the bird on all sides. While you could also use tongs, I prefer using the grill fork in the cavity of the bird in order to avoid piercing the skin more than necessary. 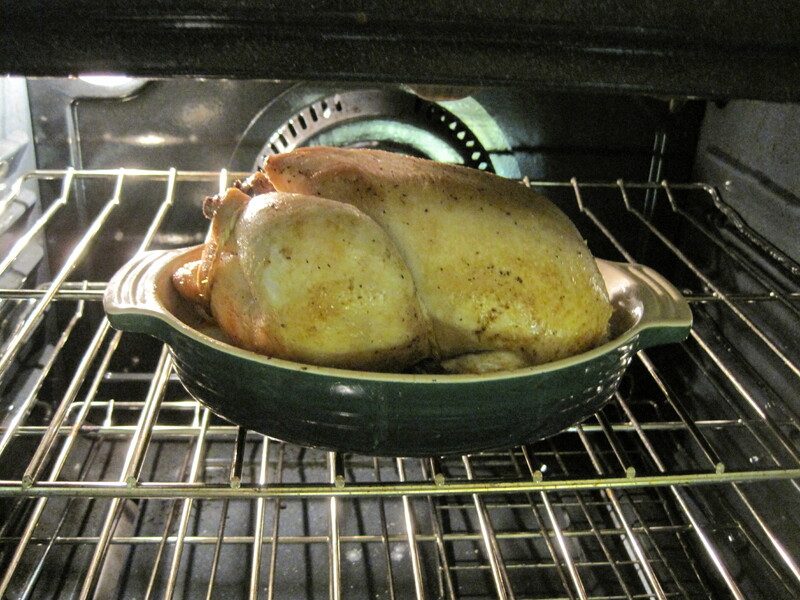 After browning thoroughly, place the bird in a roasting pan over a bed of rough chopped veggies in a 400 degree oven. (If you have the option of a convection oven, I find that using it makes your skin crisp up just a little bit better than a normal oven.) 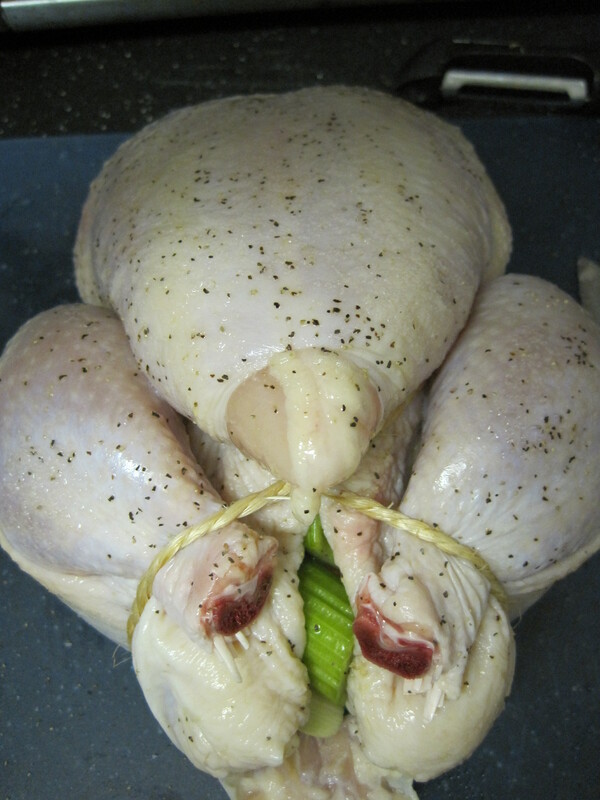 Start with the breast side of your bird facing down; this forces the juices from your bird and the veggies inside into the breast, keeping it super moist and tender. About half way through your roast, turn the bird over so the breast side is facing up. Your browned skin should get nice and crispy. Total roasting time should be around an hour; you’re looking for the juices to be clear and the bird to reach an internal temperature of 150-155 degrees. After your bird hits the proper temperature, let it rest for a few minutes before carving to allow your juices to redistribute themselves evenly. 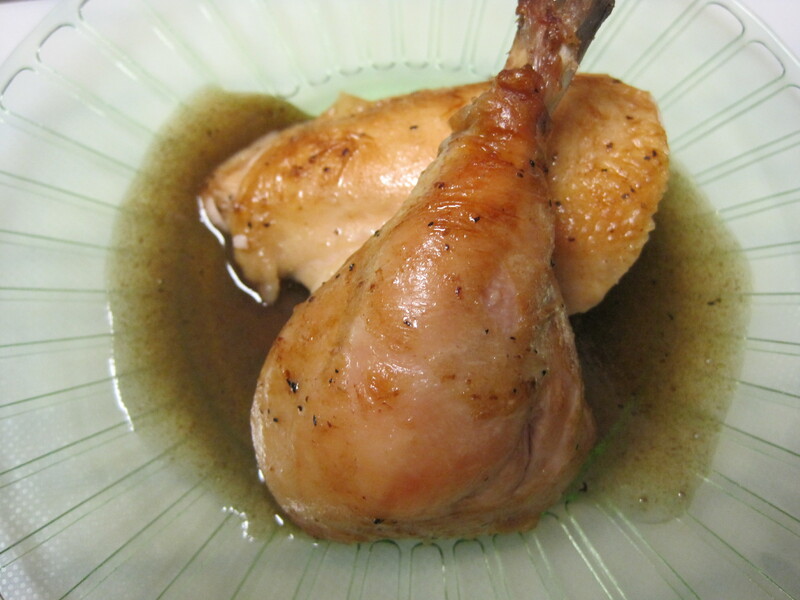 The beauty of a roast chicken is that you can do almost anything to it… I served mine with a sauce made from reducing the pan juices and a little bit of red wine and honey, but be creative. Maybe try stuffing your chicken with some veggies with lemon and sage, or some tequila soaked oranges? You really can’t go wrong. Enjoy! !